Nvidia CEO Jen-Hsun Huang says the company’s current generation Turing graphics cards are already competitive with 7nm products, according to press at its GPU Technology Conference (GTC). 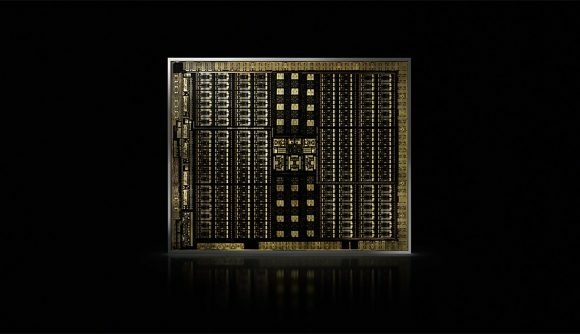 Nvidia Turing graphics cards employ TSMC’s 12nm process node, and the company is reportedly taking its time to move to greener, and significantly more dense, pastures. Both Nvidia and AMD are clients of TSMC, one of the leading foundries in advanced process nodes. The 7nm process node now makes up the majority of TSMC’s revenue stream, outpacing 16nm earnings, and expects hundreds more clients to make the switch throughout 2019. AMD, now reliant on TSMC after GlobalFoundries dropped out of 7nm R&D, is one such client set to adopt 7nm across almost its entire product stack – starting with AMD Ryzen 3000 chips mid-year. And while Huang’s words fall short of explicitly ruling out a process node change anytime soon, there’s little onus on the company to match AMD’s swift adoption. AMD has struggled to match the performance per watt of the green team ever since Nvidia doubled-down on efficiency with the Maxwell architecture. And the company will need to revolutionise its GPU architecture to compete with Nvidia head-to-head in efficiency at 7nm. Nvidia is, however, rumoured to have signed on as a launch partner for Samsung’s 7nm EUV process, alongside IBM. These parts are expected to start sampling late this year and launch in 2020. EUV technology is intended to reduce manufacturing complexity, therefore reducing costs and time spent on every wafer. Nvidia could be well-positioned to make the most of these boons with next-gen graphics cards, while also allowing Turing time to breath. After all, Nvidia left Pascal brewing in the gaming market for over two years before announcing its replacement. Nvidia did release a new generation between Pascal and Turing: Nvidia Volta in 2017. However, this was a stopgap generation that wouldn’t be offered in GeForce cards during its tenure. With Nvidia now pivoting towards datacentre and deep learning applications – spurned on by its recent $6.9bn Mellanox purchase – we could see 7nm Nvidia GPUs supercede Volta in the enterprise space long before next-gen GeForce cards supplant Turing in the gaming sphere.